Shuho Sato is a widely recognized manga artist whose Umizaru was adapted to two live-action movies. His most well-known work must be Say Hello to Black Jack (which refers to Tezuka's Black Jack) which was adapted to a TV drama series and was awarded the Excellence Prize in Japan Media Arts Festival 2002. Its sequel "New Say Hello to Black Jack" is currently serialized in Big Comic Spirits. He is also known for his cool website featuring autobiographical manga and a rebellious journal in which he discloses some shocking facts of manga industry. Recently, Sato revealed his plan to upload all of his works online, to be available at 30 yen (about 30 cent) each chapter for the ongoing "New Say Hello to Black Jack" and 10 yen per chapter for all his previous works. 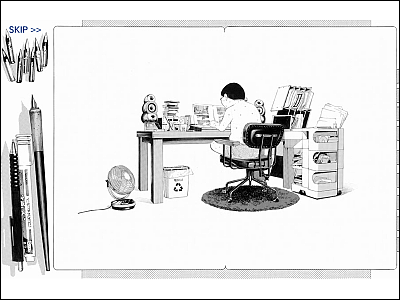 In his older posts Sato enlightened the readers that not every manga artist are rich, despite his popularity there was a time when his manga was a loss-making operation due to the low rate of manuscript fee and having to pay his staffs, not to mention the royalty from his books being fixed at 10% without any rational reason. The fact that there's no contract document between him and his publisher, and alterations in his works are frequently made by the editors without his leave (e.g. Names of the characters being changed, the monologue "North Korean covert-operations boats" changed to just "Covert-operation boats") also shocked the readers. Basically, manuscript fee is the payment for publishing the manuscript once on a magazine, so the publisher purchases the right to primarily publish the work, not eternally. The copyright of the manuscript as well as the physical original manuscript itself remains to be property of the author. Which means it's up to the author what to do with the manuscript once it's published in a magazine. Online publication will be a secondary use, which I can freely and legitimately execute. I've already finished the storyboard of my new manga. and planning to release his new title online after concluding the ongoing "New Say Hello to Black Jack". According to his entry "Manga Binbo sono 9" on April 16, his ongoing series "New Say Hello to Black Jack" and "Tokko no Shima (Kamikaze Island)" will be priced at 30 yen per chapter, previous series including "Umizaru", "Say Hello to Black Jack" at 10 yen per chapter, and 10 yen for each one-shot manga. In "Manga Binbo sono 11" posted on April 21, he informed us that paying readers will be able to read the comic he purchased as many times as he likes, for a duration of time (most likely to be one year). The payment system is now under construction, expected to be accomplished in another two months or so. The service will probably start operating around June. If this goes well, it may someday become a perfectly ordinary procedure for readers to purchase mangas online directly from the author. As far as we know, Sato is the first major manga artist to make this kind of attempt, although it might be already happening in the dojin world. Bad news for publishers, but it'll be cheaper and greener.